***This post contains affiliate links and a team member of FCS will be compensated if you make a purchase after clicking on the links. Considering an cellphone upgrade? Or maybe you’ve upgraded to the new Samsung Galaxy S5 (that phone is impressive – faster camera, amazing screen, better battery life, heart rate monitor & fingerprint scanner). What will you do with your old phone? It may be well worth your while to put some cash back in your pocket with this trade-in offer from Gazelle. 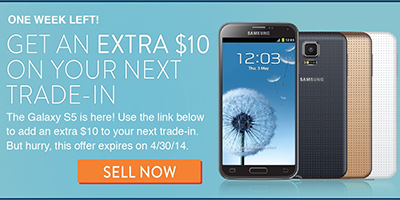 From now until the end of this month (April 2014), Gazelle is giving an extra $10 on devices traded in valuing $50 or more. This deal comes at a perfect time since the latest upgrades scheduled for multiple smartphones (Galaxy S5, Sony Xperia Z2, LG G3, etc.) are hitting the market now. In fact, Gazelle offers trade-ins for everything from smartphones to laptops to tablets…. the list goes on, so go trade in something old and get some extra cash to buy something new. Don’t sit on this deal if you’d like to take advantage of it – there’s only a week left before it will be gone. That extra $10 is money in your pocket.